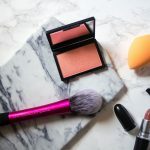 So with fall season just around the corner, I wanted to share how to mix and match prints for fall! Just because it’s fall, that doesn’t mean you have to shy away from bold prints. In fact, I LOVE embracing classic prints like camo, stripes, polka dots, and cheetah/leopard prints in my fall looks! 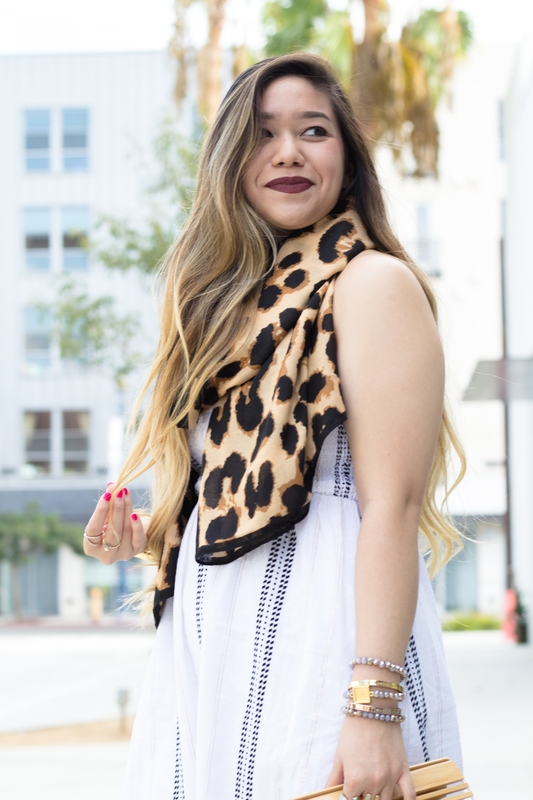 Fall fashion is SO versatile with all its layering pieces, so definitely go all out and mix and match prints for fall to achieve a unique but yet chic look that would be sure to turn heads! Because fall is all about layering fun pieces together, it makes it SO much easier to mix and match prints, too! 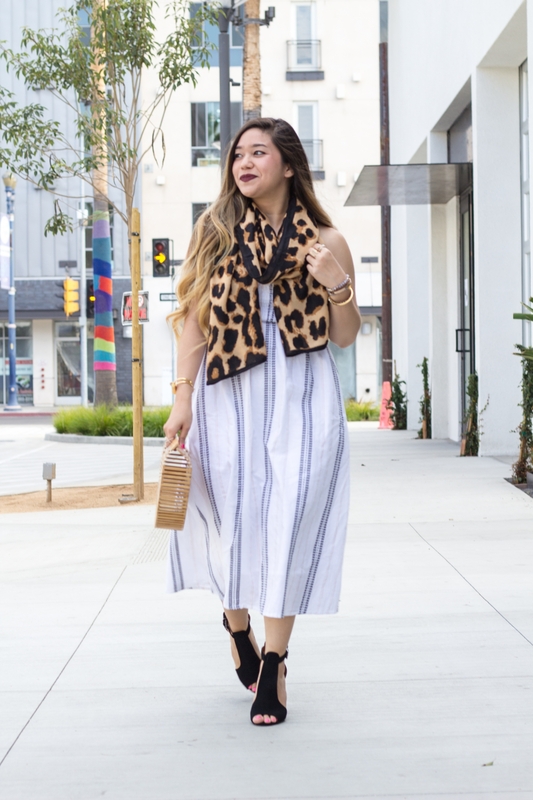 In this look, I styled a striped midi dress with a chic cheetah print scarf, both from Old Navy! This striped midi dress has the most gorgeous smocked bodice detailing couple with a subtle ruffle trim which I’m DYING over! It also has a subtle sparkly metallic weave throughout the dress, which makes it SO fun! This gorgeous dress also has a halter strap with cute tassels at the end! The best part? 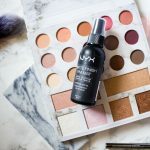 It is currently on sale for under $22! For reference, I’m wearing a small! 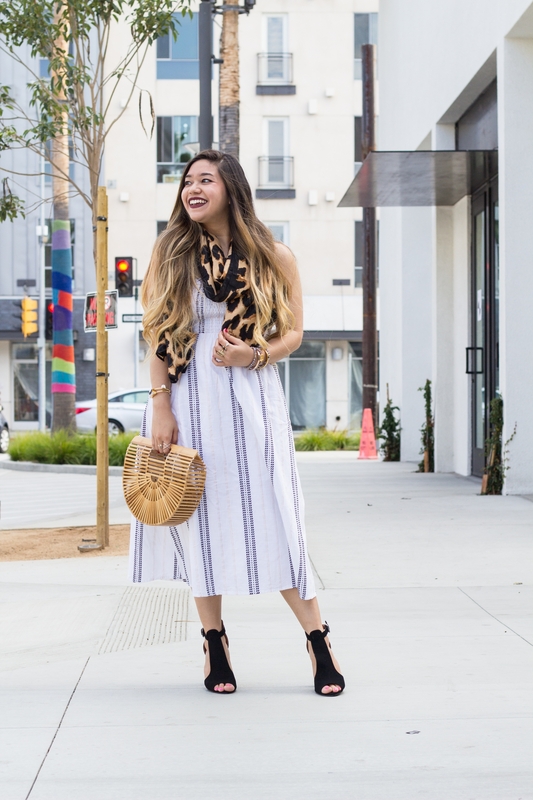 Although this striped midi dress may be a summery, fit and flare sundress when worn on its own, but when layered with the cheetah print scarf, it is the PERFECT transitional look for fall! You know, for those early fall days when it’s still not quite cool enough outside to be spotting boots, leggings, sweaters, and scarves! 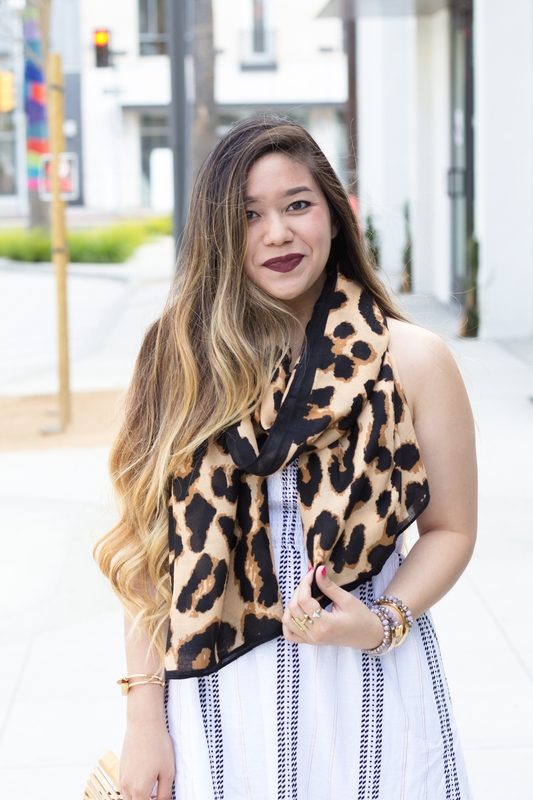 I absolutely LOVE this cheetah print scarf for fall! It is SO lightweight and the material is seriously soooo soft I could sleep on it, ha! 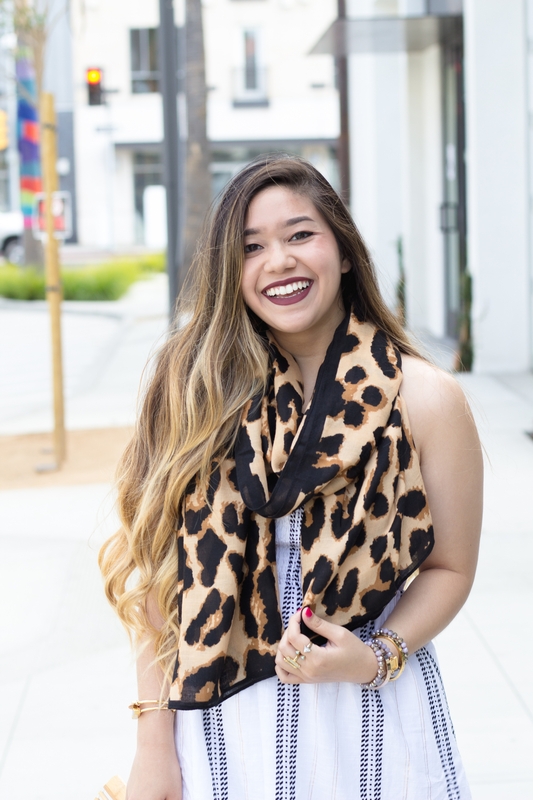 🙈 I love how bold this scarf is – It definitely stands out and makes your outfit pop! Plus, it is only $17! What do you think about this fall transitional look? 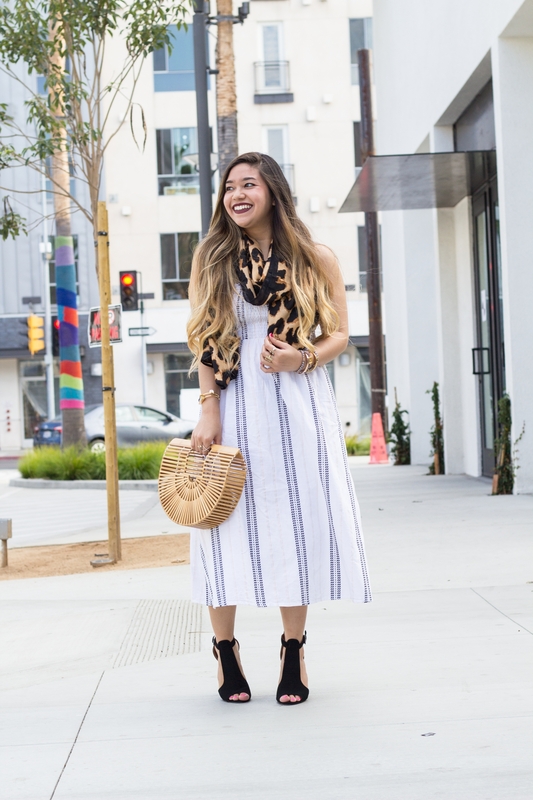 Do you mix and match prints to create a playful, colorful, and unique look? Disclosure: I was not compensated for this post; however, I received these products from Old Navy for my review. All opinions are my own. Thank you for supporting the brands that make Marblelously Petite possible.